"What is vikas (development), where is vikas, villages don't have pucca houses, if you recharge phone with 4g data pack you get 2g internet, is this vikas. show me where is vikas and I will suspend my kranti anddolan (movement). "This is not just the fight of the Patidar samaj, this is not about Dalits or Kshatriyas. This is the fight of 6 crore Gujaratis. You place a hand on your heart and tell me where is vikas. How many gas cylinders did you get, how much water do you get tell me honestly. 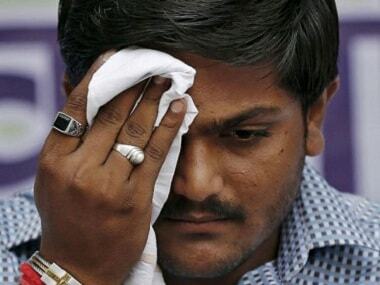 This is the fight to defeat their arrogance," Hardik said. "They may label me a Congress agent, but they have always divided the society. It was because of them that Patidar samaj was brought on roads, they were the reason Dalits had to fight for their rights," Hardik said. "And this is why we are against them," Hardik said. "The Congress version of GST places salt, which a poor person wants with expensive cigarettes and alcohol. How can I allow this? Our fight is for giving the poor their rights while Congress fights for the interests of the rich," Modi said. Narendra Modi, speaking about the Doka La crisis, said that his question to Congress is clear, "Why do you believe the Chinese and not our army and our foreign ministry." Modi said that Congress loves to question the army, they questioned the surgical strike too. "They asked for proof, they asked for pictures... should we make a film for them," Modi asked. He said that they even asked that if our side did have any casualty as our soldiers languished and suffered on border. People who talk like that should not expect votes in Congress. ​As a mark of respect for Muslim prayers (Azaan), prime minister interrupted his speech and took a long pause as people wondered what went wrong. Many in the crowd were seen cheering him, chanting Modi Modi as they waited for the PM to restart his speech. When Modi spoke again, he briefly mentioned that he had stopped as he heard the sounds of Azaan, and continued with his speech. "Congress dislikes Gujarat as they will be defeated here. Victory and defeat are a part of life. There was a time when our party would distribute sweets when we saved our deposits. These things happen in a democracy, Congress should not be consumed by such hatred," Modi said. "Congress loves asking me- Modi ji what did you do. I want to tell them due to our efforts the corrupt are languishing in jail. They could also have done that but for them fighting corruption is a non-issue," Modi said. They ask me questions about terrorism, Pakistan, and surgical strikes. "You tell me who was responsible for the problems at the root at the Kashmir issue. You tell me who is responsible for years of violence," Modi said. Congress called Gujaratis donkeys when they wanted vote in UP? "When they wanted votes in Uttar Pradesh, they referred to us as Gujarat's donkeys. Now when they have come to ask for votes Gujarat's people will clear all their accounts and show them their reality," Modi said. "Take whichever election you may like, Gujarat and saffron are one. In Gujarat election, no one apart from BJP can win and in Congress elections, nobody apart from a Gandhi can contest," Modi said. Amid chants of Modi Modi and Bharat Mata ki Jai, the prime minister started address at Navsari. "As far as the eye goes, it looks like Gujarat has donned a saffron sheet." 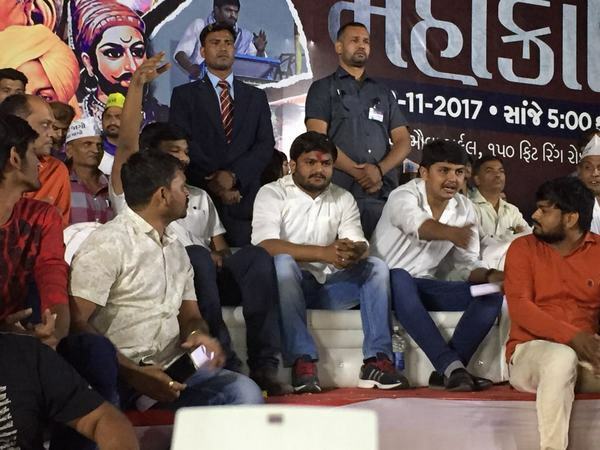 Hardik Patel, the young leader who rose to fame after the Patidar stir, was addressing a rally just 30 kilometres away from the venue of Modi's rally in Morbi. 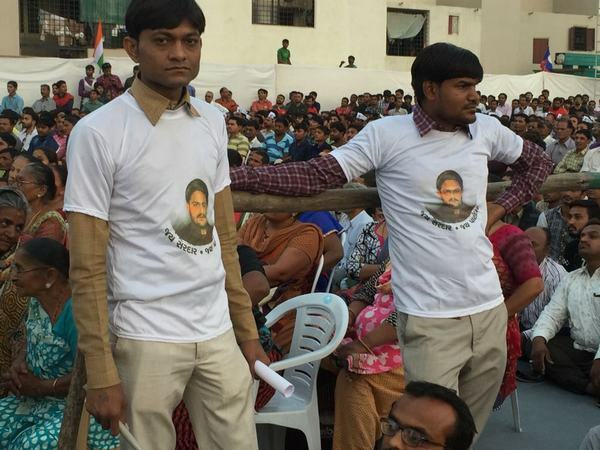 Hardik has since been tweeting pictures of crowds assembled at his rally, apparently in a show of strength. Coming down heavily on Congress vice-president Rahul Gandhi for his Gabbar Singh Tax jibe on GST tax reform, Modi said, "Those who looted nation think only of dacoits... They are propagating grand stupid thought on GST." Refering to the Congress rule, Modi told a massive gathering in Palitana, "Do you remember the water shortage in the region? This is because the Congress controlled the tanker business. It suited them to have this shortage. The BJP has changed this in the last 22 years. We have made the tanker industry irrelevant." "They hate development, they hate Gujarat, they hate Modi and now they hate sweat also. That is because they have never had to sweat it out in life & work hard. They are mocking everyone who works hard. This is their mindset. Such hatred for the poor is shocking: PM Modi in Palitana," Modi said accusing Congress of being the party of the elites. “We belong to the heirs of the fakir Gandhi. And they are the Gandhi varisdar who are born with a golden spoon.They do not know how it feels to walk barefoot and have a stone or thorn hurt your feet. It is upto you to choose which Gandhi you want. The fakir or the one with the golden spoon,” Modi said. Taking on Congres, which has earned the support of Patidar leader Hardik Patel, Modi said that the Congress is only making promises of OBC reservation to get the community's vote. He said that the Congress was the party, which stalled the process of giving OBC commission a constitutional status. "Congress is seeking votes of OBC communities but they should answer why they did not allow OBC Commission to get Constitutional Status for all these years. We brought in the move, it was passed by Lok Sabha but stalled in the Rajya Sabha, where Congress has majority," Modi said. Prime Minister Narendra Modi dropped veiled hints at considering the demand for reservation, without explicitly naming the Patidar community. He said: "I want to assure you- Congress may try to throw any roadblocks, I am committed to ensure their designs fail. Parliament is meeting soon and we are going to bring that issue on the floor of the House again. We want to give our OBC communities their due." Modi is campaigning in Patidar strongholds, which saw the maximum effect of the Patidar quota stir in last year. "Congress has no neeti (policy) or neta (Leader). It does not have any connection with the common man. How can these people create India's destiny?" asked Modi as he concluded his speech. "The Delhi treasury is for the common man. It is for poor people. We believe in engaging with the farmers so we have all these schemes for them," Modi said. "Those who ruled India for 70 years are now asking for my report card. When your family was ruling, there is SC/ST commission. However, we are also giving OBC commission a constitutional status. But you did nothing. Caste politics by Congress destroyed Gujarat. We demanded constitutional status for OBC commission but we received no answer from you," Modi said in Prachi. "Had Sardar Patel not been there, no grand temple would have been in Somnath. So there a people who are reminded of Somnath (Rahul Gandhi and Congress) I want to ask them: Do you know history? Your great grandfather,, grandfather, grandmother. Nehru was not happy with Sardar Patel's restoration work of Somanth.. Rajendra Babu sent a invite to Nehru for the inauguration. But he got an angry letter," Modi said in Prachi, a town in Somnath. Clarification: We had stated earlier that the prime minister arrived late for the Morbi rally. The BJP has clarified that while the rally was scheduled to begin at 9 am, Modi was only expected to arrive at 11 am, which he did. "Our niyat (intention) is clean. But I cannot say that of the Congress.Their intention is dynasty. It is corruption," Rupani said. Speaking before Narendra Modi, Gujarat chief minister Vijay Rupani said, "On one hand, there is development. On the other hand, there is anarchy (Congress). On our end, you would experience, sabka saath sabka vikaas. But the Congress only believes in caste politics and dividing the people of Gujarat. After Modi became the chief minister in October 2001, Congress has been struggling to find an equally strong match to counter him. Under Modi, the BJP won three consecutive Assembly elections, a feat not achieved by any of the chief ministers in the past. “It is not the BJP which is winning any election. It is in fact Modi who was winning all this while. There is a huge leadership crisis in Gujarat Congress which helped Modi to grow stronger and stronger,” Sanjay Kumar, director of Centre for the Study of Developing Societies told Firstpost. Jignesh Mevani, who emerged after the incident, is considered a hero among the Dalits here. They are talking about organising protests for their rights and justice. The Dalits only form about eight percent of the voters in Gujarat, while they make up 16 percent in the country. They are not much influential in the poll-bound state. The Dalit factor has emerged in this year's Assembly election primarily because of the Dalit movement after the Una incident. Under the leadership of Mevani, the Dalits have come closer to the Congress. Gujarat chief minister Vijay Rupani on Tuesday accused PAAS leader Hardik Patel of betraying his Patidar community and claimed that the Congress will pay heavily in the Assembly elections for portraying Prime Minister Narendra Modi as a "chaiwala" on social media. "The Patidar fight is no more for a community. It has become a private affair. The Patidars and the BJP are two sides of the same coin, they will vote for us," Rupani said at a conclave of India TV. Surendranagar district, bordering state capital Ahmadabad, is at the edge of Saurashtra region. It is poorly developed, enveloped by dusty air and potholed roads. Is BJP sitting on thin ice in Morbi Vidhan Sabha? Three months back, serious floods devastated miles of cotton crops of farmers, predominantly in Maliya Taluka when a dam overflowed. They have still not received compensation. The BJP is skating on thin ice among that constituency. "Let the Congressmen cry over noteban but people of Morbi only understand the language of vikaas. Gujaratis should be proud that for the first time , they have a have a man in Delhi. I am a Gujarati, who has a good business sense. I request you to vote all candidates of the BJP," Modi said while concluding his speech. Prime Minister Narendra Modi taunts intellectuals over GST. He said," You people call it 'Grand Stupid Talk' but I ask you have you worked for the poor? Congress wants to decrease GST on cigarette and alcohol and give cancer to people. Gujaratis won't forgive Congress for anti-poor and anti-middle class thought process," Modi said. Urea production was not an issue but the subsidy with it. But the urea produced was diverted to chemcical industries. This was the issue. We requested Congress to do something on this. But they did not listen to us. They were only interested in early black money through leaks in subsidies. "When we came to power, we focussed on water. Congress asks what is our Gujarat model. We know what is Congress' development agenda — waterpump. Our development is SAUNI of Narmada. Often, Congress promised handpump just for sake of vote," Modi said. "We have laid such water pipelines that even Congress leaders can sit in Maruti car and go," Modi said while taunting the pet project of Sanjay Gandhi. Due to Narmada project, farmer incomes are at least Rs 70,000 cores now. Under BJP, there were three agricultural university that were established, Under Congress, there were only one," Modi added. "Now people from other states and countries are coming to Saurashtra to see how we were successful to create water management system (SAUNI)," Modi said in Morbi. Just like Surendranagar, farmers mostly cultivate cotton in Morbi. They are upset that Modi has not increased the Minimum Support Price (MSP) of cotton when he would demand the same thing as CM of Gujarat from the Manmohan Singh-led UPA government. At least 40 dams in Saurashtra get water through Morbi's Machu 2 dam in the SAUNI Yojana. Yet, there are several villages which continue to starve for water in Morbi. Rural Morbi is an agrarian belt. The entire Taluka of Maliya with 40 villages has not received benefits of the SAUNI Yojana. These farmers are upset with BJP. The 1985 riots in Ahmedabad are important in the context of BJP’s rise to power. “While it began on an anti-reservation plank, it quickly degenerated into a communal one because of the entry of the BJP,” Yagnik said. Yagnik added that riots in the late 80s and in the aftermath of the Babri Masjid demolition communally polarised the state, which helped the BJP win the 1995 Assembly election. 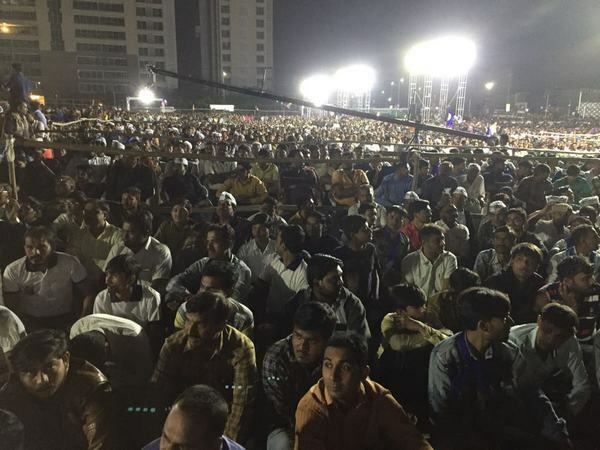 Morbi has a large Patidar population. While the urban Patels remain firmly behind Modi and BJP, the discontent is palpable amongst rural Patidars. Hardik has struck a chord here. Speaking to Firstpost, the co-ordinator of the Prachi rally said that Prime Minister Narendra Modi is unlikely to visit the Somnath. This is contrary to some media reports that he may make it to the famous Shiva temple today. However, a local police official told Firstpost that temple visits by the prime minister are revealed only half an hour before the schedule visit due to security reasons. In 2002, Modi set out on his Gujarat Gaurav Yatra in the backdrop of serious allegations of state-sponsored communal violence after the Godhra train attack where he played the same victim- hood card converting all criticism against him and his government as an insult to the Gujarati pride. And it worked. Similarly, the condemnation of state-sponsored violence established him as a veritable Hindu Hriday Samrat who had taught the Muslims a lesson. Local journalists in private conversations say the traders and industrialists are disillusioned with Modi after demonetization and GST, but won't express it to the media out of fear, since they've long been loyal to BJP and can't be seen siding with Congress. They are certainly not as okay with the decisions as they try to convey, they say. Morbi is a ceramic hub. Over 700 factories are located in the district, expected to be hit by GST and demonetisation. Yet, by and large, traders and businessmen seem to be behind Modi. It created problems initially but the reduced GST rate of 18% from 28% is no cause for concern, they say. Prime Minister Narendra Modi is going to Prachi, 20 kilometres from Somnath. It is said, one visit to Prachi is equal to 100 visits to Kashi. According to India Today, Rahul Gandhi is scheduled to arrive at Somnath temple for darshan at 1 pm while Narendra Modi is scheduled to address a public rally 1.20 pm in Prachi, 23 kilometres from the temple. Not only Congress vice-president Rahul Gandhi but also Prime Minister Narendra Modi will be visiting Somnath Temple. Modi is expected to be there at around 1 pm, reports Financial Express. BJP’s Gujarat Vikas Rally will cover 25 Assembly seats in Saurashtra and south Gujarat. "Each rally has been organised in such a way that people from five to six surrounding constituencies can also attend it," Bhupendra Yadav had said. It is no coincidence that nobody is talking about the Muslim vote bank this election season. The BJP is never known to explicitly woo the minority community; the Muslim voter has looked at the Congress as its only support. However, the Congress, this season adapted a different strategy — prioritising winnability over anything else. And caste-based movements across Gujarat in the recent past — the Dalit protests after the Una flogging incident and the Patidar agitation — have sent the Muslims to the sidelines. And poll math only warrants a change in strategy. While the Morbi was scheduled to begin at 9 am, it has been delayed now. Prime Minister Narendra Modi is expected to speak at around 10 am. The rally at Morbi is scheduled for 9 am, but Prime Minister Narendra Modi is expected to arrive around 10 am. Prime Minister Narendra Modi started his high voltage campaign with rallies on 27 November in Bhuj in Kutch district, Jasdan in Rajkot, Chalala in Amreli and Kadodara near Surat. Prime Minister Narendra Modi will address poll rallies in Morbi, Prachi near Somnath, Palitana in Bhavnagar — all in Saurashtra — and at Navsari in south Gujarat. Narendra Modi, addressing a rally in Kadodara said that the Congress has only showed disrespect and hatred for Gujaratis and now they have the guts to come and ask for support in the same stae. "In Uttar Pradesh the Congress was feeling so confident about victory. They started calling Gujaratis donkeys. And now, they are coming here to Gujarat to seek support. Nobody can insult the people of Gujarat like this. They mistreated Sardar Patel, Morarji Desa who were legendary leaders from Gujarat. There past and present shows they hate Gujaratis," Modi said. They speak about Sardar Patel but I don't want to dig out their history. They should turn the pages of Maniben (Patel's daughter's) diary, may be that will help them recollect how they treated him. Then, Morarji Desai, a Gandhiaite, became the prime minister. Overnight, Indira Ji removed Morarji Bhai from the Cabinet. The truth is Congress hates Gujaratis," Narendra Modi said. "Before BJP came to power, people were used to living under the shadow of curfews. It was hard to imagine a life otherwise. Such was the situation. In 22 years, BJP has ensured peace and tranquility in the state," Modi said. "This govt is not going to move away from the path of honesty. Those who have robbed the poor will have to give it back. Three lakh companies have been served notice whose finances were suspicious," Narendra Modi said defending the demonetisation scheme." "Has there ever been a precedent when a government helped the people own a home? Tell me which government has done anything for you," Modi asked people amid resounding cheers. He said that for the first time, there is a govt at the Centre which is helping the middle class get loans and build a house. "Rajiv Gandhi understood the problems of the people, but did he solve anything? This is Congress' problem. There is a huge difference between the villagers 30 years and today. But Congress doesn’t understand this. They think what worked then, will work now," Modi said. "In the 21st century, 18,000 villages still don't have power in India. Shouldn't Congress be held responsible?" Narendra Modi asked. He said that his government ensured that electricity reaches to each and every village. "We want to extend Ro-Ro ferry service from Kutch on one side and Mumbai on the other," Modi said. He said that the previous governments had only fooled Gujaratis while he would ensure that everything that is promised actually reaches the beneficiaries on ground. Supporters have come in busloads from more nearby talukas to attend Modi's Kadodara rally. Most of them were wearing BJP sashes and chanting slogans - Har Har Modi. Meanwhile, News 18 reported that the earlier, the venue for the rally was inside main Surat city, however, it was later shifted out to Kadodara, at the outskirts of city. Even as BJP cited logistical reasons for the change in venue, News 18 sources said that intel agencies have warned of a Patidar agitation at the rally. 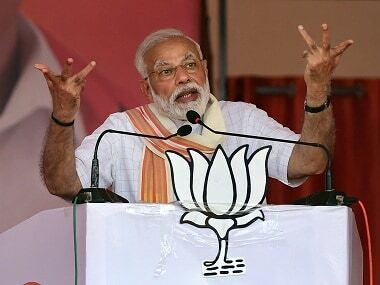 Narendra Modi, while speaking in Gujarat hit out at Congress party, saying Congress has neither niti (policy), niyat (intention) nor neta (leader). Even after 12 months, why is Congress still talking about note ban. Everyone knows life and death is part of the process, but nothing beats the sorrow of losing an earning son. Eve after 12 months of the tragedy, you still get tears in your eyes, if you lose the bread winner of the family. This is why Congress has tears in their eyes even after 12 months after demonetisation; they have lost all their black money." "Amreli has a vast coast, which could have been developed to benefit so many. Congress could have changed your future but for 70 years they did nothing. We brought job opportunities through port land development and blue economy. You'll enjoy the benefits soon," Modi tells Amreli. "Since I was a child, I heard one thing. 'Ghogha-Dahej RORO ferry service' 'Ghogha-Dahej RORO ferry service,' who stopped you from making this service when you ruled the country for 70 years? We made it happen, this is called progress. This ferry service is going to be functional from Kutch to Mumbai. The whole kutch andmn kathiawad will reap the benefits of this"
"They know that the common man, even the one who lives in villages, have aspirations of having good road, and then good tar roads, and then good double track roads... this hunger for development should persist, only then will India progress." "The Congress party, which had reigned the country for more than 70 years. What stopped them from developing Amreli district. Hatred for Gujaratis and our state flows in their blood," Narendra Modi said. "I am glad I got the opportunity to visit Amreli. I have come here to take your blessings," the prime minister said as he greeted a cheering crowd that had been waiting for him for over two-and-half hours. Quiz: How well do you really know the state that's about to go to the polls? "Congress is making baseless allegations against BJP and me. But the people of Gujarat will teach them a lesson on 9 December (polling day). I ask you, will these people (Congress high command) who sit in Delhi help in Gujarat's 'vikaas'?" Modi said during his address. "There used to be a kind of unofficial curfew every day under Congres rule. Secuirty was an issue. But have we not provided you with security? Once there is security, there is peace and communal harmony," Modi said. "Our forces have scored a double century," Modi said while referring to over 200 militants being killed this year. I am asking you has any government at the Centre thought of giving free housing to poor and middle class? We are helping them get home loans so that they can get a home," Modi said. He added," We are making sure that even those who wear chappal will fly planes." "Morarji. He had an impeccable character and a Gandhian. But he is a Gujarati. The way the Gandhi family insulted him. They just threw him out. Babubhai Patel became CM. But they could not tolerate a Patel as CM. The smae about Chimanbhai. We tried to help him make CM (in 1990). After that Keshubhai became Cm, the first from Kathiawar," Modi said while claiming that Congress conspired against Patels. These Congress leaders have lost their charecter. The Gujarati janta does not like you (Congress) but still you are working so much. You insulted Sardar Patel.. We all you know what you had done to Sardar. Everything is is recorded in Manibehn diary. "These people spoke of bringing Narmada here. But they ridiculed and insulted us for demanding better facilities. Had Congress helped us, then we would have had Narmada at least 30 years back," Modi said. He added that only after the BJP government came to power that policies were made to help people benefit from Narmada project. "In last fifteen years, you have chosen us three times. You all know that Gujarat has adopted the route of "vikaas'. We have not left anything for ensuing your welfare in Jasdan," Modi said. After addressing a rally in Kutch's district headquarter of Bhuj, Prime Minister Narendra Modi will be addressing a rally in Rajkot's Jasdan. While the rally was supposed to start at 11 am, it has not begun yet. "Congress was totally in favour of the GST during the discussions. However. when after the dicussions, it began opposing the new tax law." Modi said during the Bhuj rally. In spite of the problems in the city, there are several voters who would continue to vote for Modi out of sheer habit. The water woes were a poll issue in 2007 as well as 2012. But it did not hamper BJP's chances. A large constituency cannot conceive of voting against BJP. Rupani does not wield much of an image. Modi's charm endures, which was evident in Paresh Rawal's speech when he had come to inaugurate a local BJP office in Wadhwan. He hardly mentioned BJP. "Ek taraf congress hai, aur ek taraf Modi saheb," he kept saying. Two BJP youth workers, Chetan Patel and Milan Patel, believe that Patels are not as angry with the BJP as it is being projected in the media and by the Congress. "Right now, it is 50-50. but after Modi's rally, it will be 70-30 in favour of BJP," they claim. There are several farmers who are disatisfied with Modi even though their water problem has been resolved to a large extent. Surendranagar is a cotton belt. When he was the Chief Minister of Gujarat, he demanded higher MSP from the UPA-ruled central government. Now that he is PM, the MSP continues to be 810 rupees per 20 kilos while the expenses are around 700 rupees per 20 kilos, say farmers. These farmers seem to be titling towards Congress. Lack of deliverance by BJP and lack of trust in the Congress made many people say they will abstain from voting in the elections. The voter turnout in Surendranagar would be interesting to look at on 9 December. BJP has its task cut out. Jains and Kolis, who are in large numbers in Surendranagar here, and who have been BJP's traditional vote base are upset over ticket distribution. The fight is on in Surendranagar, with just one caveat that Modi is yet to arrive in the district. The ambitious Saurashtra Narmada Avtaran Irrigation (SAUNI) Yojana is supposed to be benefiting Surendranagar the most. The main Saurashtra Branch Canal brings water to Surendranagar, from where three of the four pipe canals, which are supposed to distribute water to the entire region, originate. Farmers in rural Surendranagar are particularly pleased with SAUNI. The Botad Branch Canal originating from Dholidhaja dam in Surendranagar runs through the district covering well over half of the 600 plus villages. Since the district is a large cotton producing belt, farmers' water woes have been resolved to a great extent, and they credit Modi for it. It is instructive how Narendra Modi is focusing on the past to build his narrative of present. In his first pit stop in Bhuj on Gujarat campaign trail, the prime minister embarked on a two-pronged strategy to counter Congress. One, highlight his achievements in Kutch as Gujarat chief minister. Two, project himself as the son of soil and claim that his insulting him is akin to insulting Gujaratis. None of these are exactly new strategies but Modi obviously feels confident enough that his work as an administrator — be it rebuilding Kutch after the devastating earthquake of 2001 or brining Narmada to the water-starved district — has not been forgotten. In his avoidance of GST topic and conflation of self with Gujarati 'asmita' lies another pointer. A tacit acceptance that Modi is aware of the potential political repercussions of a glitch-ridden implementation of GST. "Pakistan released Hafiz Saeed. Why is Congress clapping for it. I don't understand this because a terrorist has been released," Modi said referring to Rahul Gandhi's tweet questioning Saeed's release from house arrest. "At a time when Doka La was going on, Rahul was hugging Chinese ambassador. We conducted surgical strike after Uri attack but did Congress do anything after Mumbai in 2008? This is the difference in leadership," Modi said on surgical strike and Doka La standoff. "Had Congress helped us with the Narmada project, we would have got the water 30 years back. You people would not have to migrate to other places," Modi said. "There are so many tourist sites in Kutch that tourists will take more than a week to complete their tour to this district," Modi said. "Rann was already there. But I thought that we can turn it into tourist spot and earn money. Our mantra is vikaas so we did it. People never imagined that there can be any kind of farming in Kutch. At one side is desert and then another side there is Pakistan. Now it is a krishi shtra. Nobody thought that saffron can be grown here. After drip irrigation, it is a model for farming," Modi said. "There was an Anjar earthquake in 1956. The earthquake was so severe that Pandit Nehru had to come here. But do you remember the Congress doing anything for you people. But now this party is asking our report card.. See we did so much after 2001 earthquake. Vajpayee sent me to Gujarat to help Kutch. I took the responsibility of rehabilitation. My training began from Kutch crisis itself. You have helped me grow like a boy. Now these Congressmen are blaming me over corruption. Will you forgive Congress?" Modi said. Narendra Modi urges the crowd to bless the candidates and vote for them. Security preparations are on full swing in Amreli's Chalala, where Modi is expected to address a rally at 1 pm. Chalala is 25 kilometre from the district headquaters Amreli. The delay is apparently because Lallan College Ground, where he is to speak, was more than half empty at the scheduled time. Now, there are better crowds and he is likely to reach anytime now. Rajyaguru had won the previous election from Rajkot (East) constituency. He was among the three lucky winners for the Congress from the 38 urban constituencies in Gujarat's three big cities — Ahmedabad, Surat and Rajkot. But, acting on his promise of chasing the chief minister, he decided to shift to Rajkot (West) last year. "I decided to contest against Rupani the moment I heard he would be named chief minister. He is not a good man, he needs to be defeated," he says. Gujarat chief minister Vijay Rupani has accused the Congress of seeking refuge in casteism and "outsourcing" its campaign to caste leaders while dismissing any threat to the BJP's poll prospects from the Congress-Hardik Patel tie-up. He alleged that the Congress was "deceiving" the people over the issue of reservation, while the agitators were lining up for poll tickets. 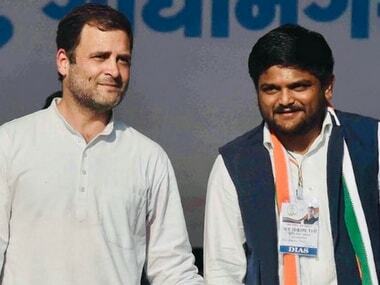 Patel quota agitation leader Hardik Patel's open support to the Congress in the December Assembly polls is not an electoral alliance but a "deal" between two sides, Rupani told PTI in an interview. Just ahead of Modi's rallies, BJP releases the names of 34 candidates for the upcoming Gujarat elections. With the latest list, the names of all BJP candidates have been released. CNN-News18 quoted BJP sources as saying that the party shifted the rally from Kamrej to Kadodara after sensing trouble from the Patidar community. The report added that the party shifted the rally about two days back. Modi earned encomiums as the 'Hindu Hriday Samrat' (Hindu heartthrob) in post-Godhra Gujarat, moreso after his statewide Gaurav Yatra that saw rabid Muslim-bashing, but brought him bountiful seats in the election that followed in 2002. However, no sooner did he acquire national ambitions manifested in the three-day Sadbhavana fast in September 2011, that he sought to open a line to the minority community through Ahmedabad-based businessman Zafar Sareshwala, who was subsequently appointed chancellor of the Maulana Azad National Urdu University, Hyderabad after Modi became prime minister. Prime Minister Narendra Modi reached Kutch and proceeded to famed Ashapura Mata temple at Mata nou Madh. He offered prayers to the deity and met devotees outside the temple. Prime Minister Narendra Modi, who begins his whirlwind campaign from the desert district of Kutch that was devastated in the January 26, 2001, earthquake, will first offer prayers at Mata nou Madh temple that falls in the Abdasa constituency. The significance of the visit to this temple of local deity Ashapura Mata is that it is located in an area with a sizeable Muslim population. Local sources say even one visit by Modi there will pep up the Hindu population in the area. The rally is in Bhuj but all BJP contestants from Kutch district would be on the podium with Modi. In North Gujarat's Radhanpur, as many as 2,000 Congress workers have threatened to resign from the party to protest the candidature of Alpesh Thakore, who joined the party just a month ago. According to CNN-News18, Dalit activist Jignesh Mevani. who has been spearheading a campaign against the Narendra Modi government, along with Hardik Patel and Alpesh Thakore. will be contesting as an Independent from the Vadgam constituency. Votes will be counted on 18 December, the same day as the results of the Himachal Pradesh Assembly election. No, nothing is simple in this year's election. It is turning out to be a racy whowinit even Holmes would have left alone. Two things are clear after a fortnight on the campaign trail: One, both parties are confident in public and confused in private. Two, Hindutva is getting replaced with caste identity, depriving the BJP of its biggest weapon. The star campaigners include Union ministers Rajnath Singh, Nitin Gadkari, Arun Jaitley and Sushma Swaraj, chief ministers of BJP-ruled states — Yogi Adityanath and Vasundhara Raje — as well as several Gujarat BJP leaders. 89 seats of Saurashtra and South Gujarat region will go to polls in the first phase of voting on 9 December. These 89 seats come under 19 districts of the state. While Modi will visit his home state today, BJP chief Amit Shah is already in the state and actively campaigning. On Sunday, Shah slammed Congress for lacking an agenda for the elections and said, "Congress lacks leaders as well as strategy." In Kutch, from where Modi begins his tour on Monday, the entire Congress-controlled agriculture produce market committee along with hordes of supporters quit the Congress and joined the BJP in protest against official party nominees. A day ahead of Prime Minister Narendra Modi’s much-awaited campaign tour, Congress leaders had to call in the police to prevent furious cadres from creating ruckus at the party headquarters in Ahmedabad's Rajiv Gandhi Bhawan, hours after it declared the third and the final list of candidates. Congress leaders in several constituencies threatened to resign from the party if "imported candidates" were not withdrawn and replaced by "dedicated partymen” of their choice. "Each rally has been organised in such a way that people from five to six surrounding constituencies can also attend it," Bhupender Yadav, Gujarat BJP-incharge said. Modi is slated to visit Jan Sabha in Bhuj at 11 am, while he will be in Jasdan city in Rajkot at around 1.20 pm. He will be in Amreli at 3.00 pm and he will finally visit Kamrej in Surat at 5.15 pm. Prime Minister Narendra Modi will address people in Bhuj town of Kutch district and later in the day in Jasdan town of Rajkot, Dhari in Amreli and Kamrej in Surat district. Prime Minister Narendra Modi will begin his tour from Kutch disrict in Gujarat. According to his itinerary, he will first visit the famous Ashapura Mata temple before starting his campaigning. Prime Minister Narendra Modi will address eight rallies on November 27 and 29 in different parts of Saurashtra and south Gujarat, where polling for the first phase of assembly polls will be held on 9 December. "For 40 years, the Congress did nothing on One rank One pension. Congress leaders are masters in gossiping. Congress alloted 500 crores. They just duped our soldiers. Congress had no idea of the intricacies of the OROP issue. If they had done some research, then they would have realised that Rs 500 crore was nothing," Modi said. Prime Minister Narendra Modi will address four rallies on 29 November in different parts of south Gujarat, where polling for the first phase of Assembly elections will be held on 9 December. On Wednesday, Modi will address poll rallies in Morbi and Prachi villages near Somnath, Palitana in Bhavnagar and at Navsari in Surat city in south Gujarat, Gujarat BJP in-charge Bhupender Yadav told a press conference in Ahmedabad. "Each rally has been organised in such a way that people from five to six surrounding constituencies can also attend it," Yadav added. Sources state that the prime minister will arrive in Morbi at around 11:00 am, while he will reach Prachi village in Somnath at 1:25 pm. His visit to Pali will kick off at 3:30 pm and he will end his tour with a rally at Navsari at 5:30 pm. 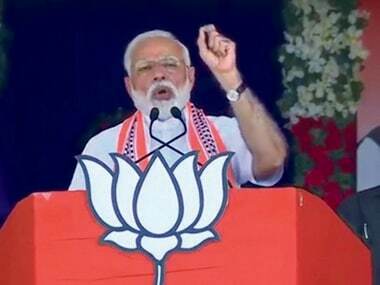 Modi, who had started his high voltage campaign with rallies on 27 November in Bhuj in Kutch district, Jasdan in Rajkot, Chalala in Amreli and Kadodara near Surat, took on Congress vice-president Rahul Gandhi and the opposition party on issues related to China, Lashkar-e-Taiba's Hafiz Saeed, the surgical strike as well as corruption. During his campaign in the state in the last few days, Rahul had trained his guns at the Modi-led government over the Rafale fighter aircraft deal, demonetisation and alleged corruption charges on BJP president Amit Shah's son Jay Shah. In response, Modi slammed the Opposition over its criticism of the Central government. At the Bhuj rally on 27 November, Modi pitched the election as a fight between "trust on development and dynastic politics." He asked the people of Gujarat not to forgive Congress leaders as they had levelled baseless allegations on the "son of Gujarat" who has a stainless public life. "I want to tell them that I am Modi, who is ready to sell tea but will never commit the sin of selling the entire country," he said, in an apparent reference to scams during the Congress-led UPA rule. Modi also trained his guns on Rahul, accused him of applauding the release of Hafiz Saeed in Pakistan and asking why he hugged the Chinese ambassador during the Doka La standoff. "You are happy to hug the Chinese ambassador, you are clapping at the release of Hafiz Saeed, you cannot respect Indian Army's surgical strike... But why did you speak about it? You could have just remained silent," he said in Bhuj, not specifying how and where Gandhi had hailed Saeed's release. Modi's initial speeches in the poll-bound state have already riled up the opposition, with Senior Congress leader Anand Sharma saying that Modi was running away from the real issues. "The prime minister is being emotional just to run away from real issues. Why doesn't he speak about real issues than of 'being a son' and all that? Everybody knows he is from Gujarat. Nobody is denying that. But why go on repeating that instead of talking about development if it has really been carried out in the state," he said about Modi's comments on 27 November. It is worth looking forward to how the prime minister will respond to these barbs by the Congress party on Wednesday. The polling for the two-phase elections in the state, having total 182 assembly seats, will take place on 9 and 14 December and votes will be counted on 18 December, the same date as the Himachal Pradesh Assembly elections.